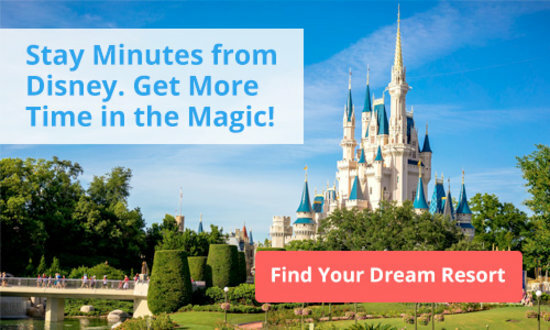 While exploring Disney’s largest park, you’re going to work up an appetite, and sometimes that hunger comes quick. 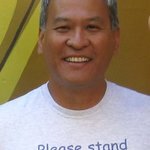 You don’t always have time to make reservation, and when kids are hungry, they’re hungry – no negotiating! But as a parent you’re also thinking about healthy food, and something delicious for yourself. 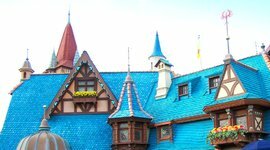 These Magic Kingdom restaurants offer counter-service options that are more gourmet and healthy than your typical theme park meal of pizza, burger, and fries. They’ll give you energy to keep going without the sleepy feeling that you get from a heavy, greasy meal. It’s a charming place that’s even better if you can snag a window seat in front the boats departing for It’s A Small World. Be sure to wave and smile as they pass by. The food here is Mediterranean and Italian-American with three different flatbreads, meatball sandwich, and a couple of salads. But don’t overlook their side dishes. You may just find yourself addicted to those garlic roll bread knots. During the winter months, I’d highly recommend the tomato basil soup. It’s open for breakfast, but what they really do well are their waffles. They have sweet and savory options. You might not think that the Ham, Prosciutto, and Cheese Waffle Sandwich would be good at all, but it is! 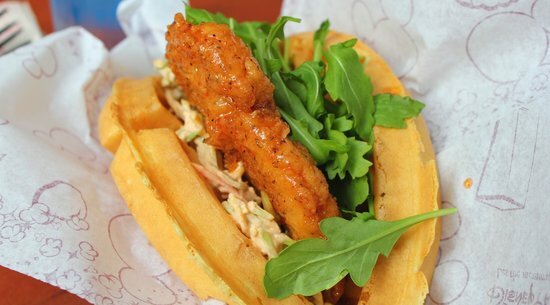 And if you’re a sucker for chicken and waffles then you can get them here too. 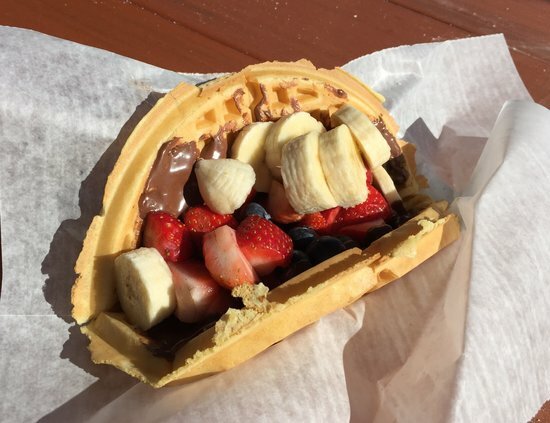 But, the real star of the show at this Magic Kingdom restaurant is the Nutella Fresh Fruit Waffle sandwich. It’s a delicious combination of Nutella, fresh strawberries, blueberries, and sliced bananas, sprinkled in powdered sugar. It’s decadent, refreshing, and soul satisfying all at the same time. This the spot for lovers of fried fish and shrimp. They have plenty of healthier options too that are equally delicious. Battered fish and fried shrimp, may be what you crave, but if you want something lighter, try the Lighthouse sandwich with hummus, tomato, and slaw on a multigrain bread. There’s also a lobster roll, two tasty meal-sized salads, and a tuna sandwich. 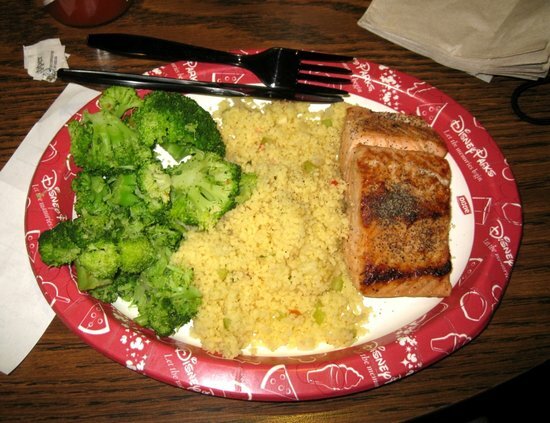 But the star of the show here is without a doubt, their grilled salmon. It comes with a side of couscous and steamed broccoli. Add a little Tabasco for some extra kick. 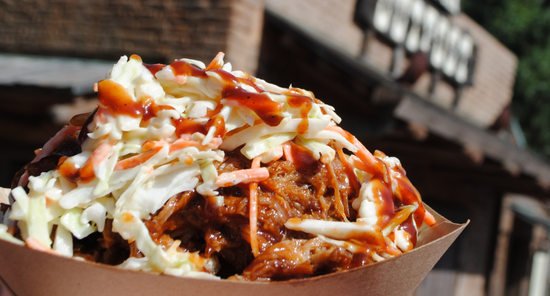 Fans of pork and turkey will rejoice! You can satisfy cravings with a regular turkey sandwich, or the barbecue turkey sandwich. Hand-carved pork and the brisket sandwich are also winners, as are the pork brisket or turkey mixed green salad. For a vegetarian option, the portobello sandwich is surprisingly satisfying. Despite my pledge that this is a guide for food beyond fries, I’m making this as an exception, because this is not your usual fries. This Magic Kingdom restaurant focuses on different ways to serve waffle fries. It’s similar to the Canadian poutine, if that’s of any help. You wish, for the sake of your waistline, that you won’t like the Brown Gravy and Waffle Fries, or the BLT Waffle Fries, or the BBQ Pork Waffle Fries, or the Tex-Mex Waffle Fries, but you will! This is where you just have to forgive yourself and indulge in the simple, guilty pleasure of high fat, high carbs food. Besides, you’ve been walking all day long and you’ll continue to walk for a few more miles ‘till it’s all over. So keep telling yourself that you’ll burn it off, you’ll burn it all off! Or better yet, these fries are made for sharing. So sit around with the people you love and share the calories! Now, as if that type of indulgence isn’t enough, the Sweet Potato Nuggets in the “Desserts” section will push this over the edge. They’re warm and covered with powdered sugar. Oh yes, you know you’re in serious trouble now! 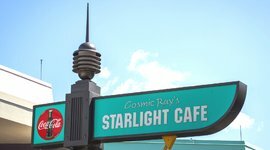 As you’re being serenaded by the performance of Sonny Eclipse, you’ll find a wide variety of familiar food. Sure, you may have your burgers and fries, but don’t miss the rotisserie chicken, BBQ pork sandwich, and Greek salad. 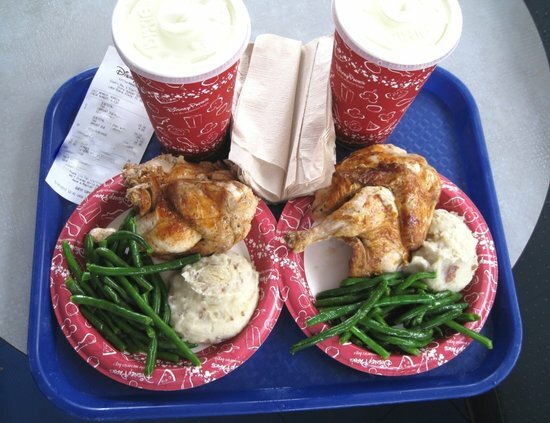 The favorite here is definitely the rotisserie chicken, which comes with mash potatoes and vegetables. 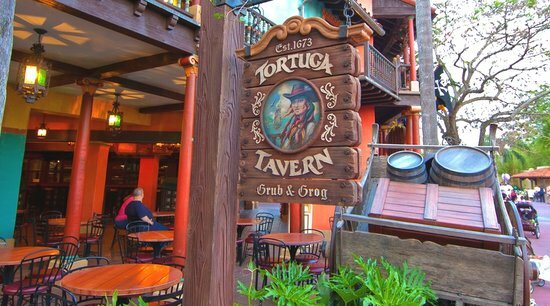 With a little bit of pirate theme, this Magic Kingdom restaurant serves typical, but delicious Mexican fare. The bean and chicken burritos are good standbys for anyone not willing to do anything too adventurous. However, the beef bowl and vegetarian bowls are not to be overlooked. They may not be as good as the ones in Chipotle, but they’re definitely worth considering. The interesting thing here is that the kids menu item, the cheese quesadilla, makes for a very nice snack if you’re just a bit peckish, but not wanting a full meal. 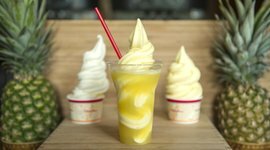 There’s only one thing you need to know about this restaurant: Dole whip float! It’s a pineapple juice float, topped with a soft-served pineapple ice cream, and it’s become so legendary that there are Disney pins and t-shirts featuring this concoction. It’s probably the most refreshing thing you can get on a hot and muggy Orlando summer day. Get your Starbucks fix here. 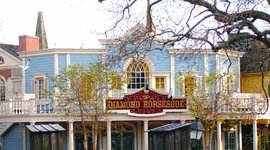 It’s a full-blown Starbucks serving lattes, frappuccinos, and all your favorite Starbucks drinks. 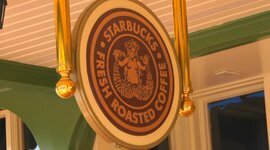 There are also pastries and sandwiches that you’d normally expect from a typical Starbucks cafe, but with the addition of items from a Disney bakery.